Despite Southern California’s large Hispanic population, Latin American art is seldom shown. Aside from some museums’ pre-Columbian sections and paintings by well-known artists like Frida Kahlo and Diego Rivera, the Americas south of ours might as well be unconnected to our landmass, perhaps on the opposite hemisphere. As of this month, all this has changed, at least temporarily. A sprawling series of shows and events, “Pacific Standard Time LA/LA: Latin American and Latino Art in LA,” (abbreviated PST: LA/LA) has placed Latin American artists in the spotlight at scores of museums and galleries. This was spearheaded by the Getty, which funded the lion’s share of major shows via grants totaling $16 million to selected institutions. Additionally, it invited commercial galleries and nonprofits to participate under its umbrella. Nearly 80 museums and nonprofits are listed as participating partners—and that doesn’t even include the numerous commercial galleries. This is the second significant iteration of PST. It follows “Pacific Standard Time: Art in L.A. 1945-1980” which involved exhibitions at about 60 venues in 2011-2012 and $10 million in grants. The previous iteration’s historical nature and didactic spirit offered a chance to learn about influences to the contemporary L.A. art scene. As its time period ended in 1980, the art on view then seemed removed, specific, and scholarly. After all, only so much art had been made over the 35-year period and survived 30 years later. PST: LA/ LA is thematically more open, spanning a wide geographic area rather than a narrow set of years. Effectively, it’s transplanted concentrated portions of extrinsic art scenes into Southern California, figuratively and literally. One recipient of much local publicity is NuMu (Nuevo Museo de Arte Contemporáneo), a tiny one-room Guatemalan museum inside a former egg stand. 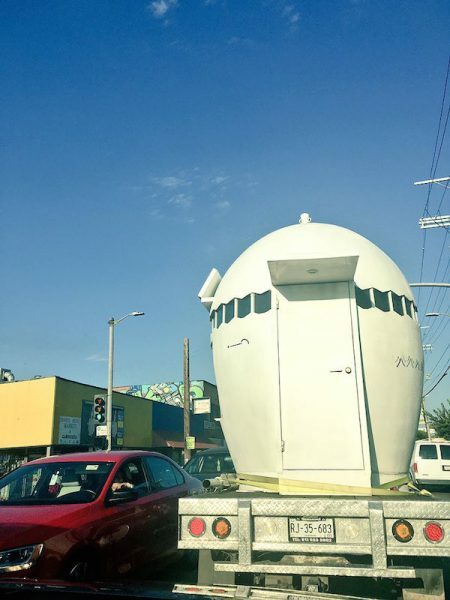 After cruising Los Angeles streets, it’s now on view at LACMA. Having arrived in Los Angeles, Guatemalan museum NuMu turns onto Wilshire Blvd. en route to LACMA. Broader cultural savor, both auspicious and negative, accompanies the art. At Jason Vass Gallery, Emiliano Gironella Parra’s powerfully morbid sculptures and paintings bring visions of cartel violence to the U.S., whose illegal drug demand helps cultivate such afflictions in Mexico. Emiliano Gironella Parra, “Camioneta gris” (Gray Van), 2010, mixed media, 99 ¼ x 59 ¾ x 37 ½”.© Emiliano Gironella Parra. Currently on view at Jason Vass Gallery, Los Angeles. The few shows that I’ve seen so far have already given me the feeling of having traveled abroad; and I’ve barely scratched the surface. 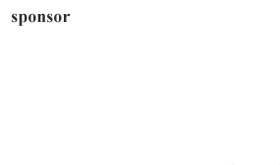 Even one who somehow manages to see all of the shows PST: LA/LA offers (which theoretically might be possible) will barely have seen a miniscule fraction of recent Latin American art. It places in perspective the untold amount of creativity and artistic variety that flourishes beyond the southern border of the U.S.—and even domestically among Latino artists. The scarcity of Latin American art shown here in Los Angeles, where Mexican culture has always been integral, might lead one to believe that little is going on in the way of contemporary art south of our country. One would think PST: LA/LA would be redundant in highlighting Latin American art; but many artists are being shown locally for the first time. For instance, a newly relocated and renamed museum, the Institute of Contemporary Art Los Angeles, just opened with the Southern California debut of renowned self-taught artist Martín Ramírez. Conveying the feeling of being in an uncanny world, the Jalisco-born artist’s work is so unusual, compelling, and relatable that it’s hard to believe it wasn’t shown here before. 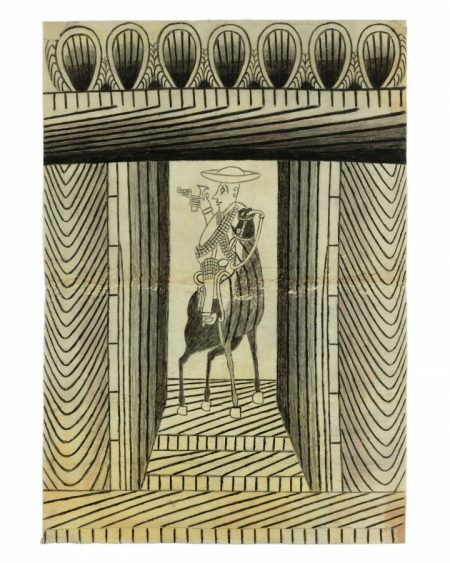 Martín Ramírez, “Untitled (Horse and Rider with Frieze)”, n.d. Gouache, colored pencil, and graphite on pieced paper. 34 x 24 in. Collection of Jim Nutt and Gladys Nilsson. © The Estate of Martín Ramírez and Ricco/Maresca Gallery, New York. Photograph by Tom Van Eynde. Currently on view at Institute of Contemporary Art, Los Angeles. Kukuli Velarde, “Native Hysteric Macuarra (Vulnerable, defenseless. A fascinating prey. She gets scared easy)”. Currently on view at American Museum of Ceramic Art, Pomona. Implicitly and explicitly, many shows feature social inquiries and critiques of Latin American countries’ culture and politics as well as our own. Colonialism, indigenous peoples, oppression, and ethnocentrism are common themes. 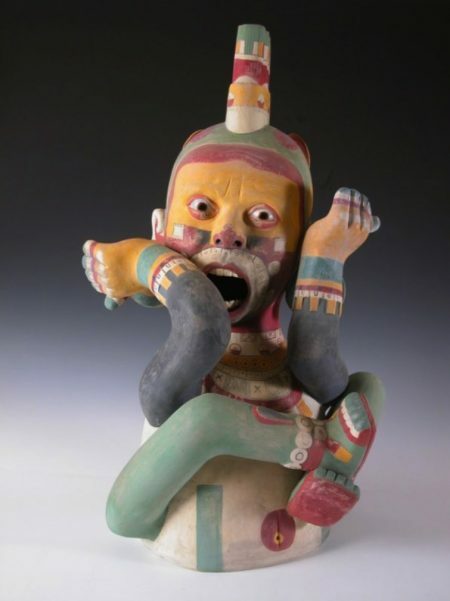 The American Museum of Ceramic Art in Pomona is showing Peruvian artist Kukuli Velarde, who re-envisions Pre-Columbian sculptures to comment on contemporary prejudice. 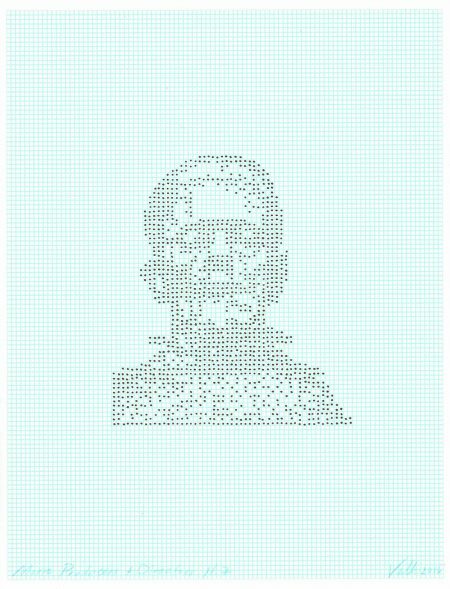 Closer to home, Los Angeles artist Linda Vallejo incorporates Latino demographics into carefully contrived images on graph paper at bG Gallery. 11 x 8.5 in. Currently on view at bG Gallery, Santa Monica. Many artists are inconspicuous outside their home countries and sometimes even within them. Ultra-specialized themes of large group shows include queer Chicanos and Sino-Caribbean artists. Several shows feature women only, most notably “Radical Women: Latin American Art 1960-1985” at the Hammer Museum. Miles from Los Angeles, the Millard Sheets Art Center exhibits Judithe Hernández and Patssi Valdez, founding female members of different Chicano artist collectives. Nearby, Claremont colleges host two other women’s shows. These are off the beaten path, so their PST participation might encourage visits from afar. 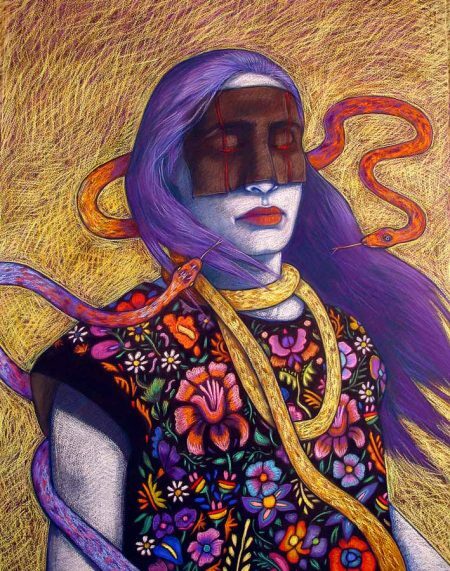 Judithe Hernández, “Salvate Mexico!”, 2010. Pastel On Paper , 30×22.” © Judithe Hernández. Currently on view at Millard Sheets Art Center, Pomona. A particularly interesting outlier is “Mundos Alternos: Art and Science Fiction in the Americas” at UC Riverside ARTSblock almost 60 miles from Los Angeles. Notions of cultural and geographic alienation pervade this exhibit of artists who view reality from sci-fi perspectives. In conjunction with PST, it provokes introspection on local and national ethnocentrism as well as art world parochialism. During a recent interview, “Mundos Alternos” curators emphasized having visited artists in other Southwestern states, the Midwest, and Texas to avoid merely showing a bicoastal array of U.S. Latino artists. Living in a metropolis that’s a major art hub affords the feeling that the local scene is the only one, or at least the one around which all others revolve. Such provincialism is heightened by self-concepts of cultural and geographic superiority that currently are so prominent. At present, PST might seem reactionary; but the theme was decided years ago. The Getty began distributing funds in 2013. Certainly, it isn’t immune to potential criticism. With an endowment of $6.7 billion, the J. Paul Getty Trust is the world’s richest art institution. Motives additional to pure goodwill must exist, especially with Bank of America listed as a sponsor beside the Getty’s logo. But who can complain? This financially and ideologically forceful initiative could be of historic consequences. It will increase the estimation of undervalued artists. Ultimately, it evinces the power of institutional bestowal and collaboration. For last October’s AEQAI, I wrote about Maiden LA as an interesting DIY alternative to the museum biennial it mimics. PST includes prominent institutions as well as obscure and alternative venues. By way of publicity and financing, the colossal supports the tiny; and vice versa by way of sheer aggregated mass. PST’s grassroots collaboration could serve as a model for something that could be done with fewer resources in smaller cities such as Cincinnati, based on any theme, towards the goal of mutual benefit and diverse exhibition of intriguing art.